The Port of Houston is one of the busiest ports of entry in the United States. It handles more waterborne foreign tonnage than any other port in the country. What comes in on a ship usually leaves on a large truck. In fact, longshoremen often offload a ship’s cargo directly onto a waiting tractor-trailer, when then pulls out for parts unknown. When fully loaded, these large trucks weigh over 80,000 pounds. That bulk includes hundreds of gallons of highly-flammable diesel fuel. Additionally, due to the ongoing truck driver shortage, many of these large vehicle operators have little practical experience. The combination of a large vehicle and a novice operator is the recipe for a serious big rig crash. Substantial compensation is available in these cases, as outlined below. What Causes Harris County Semi-Truck Wrecks? Operator fatigue is one of the leading causes of semi-truck wrecks. Most shipping and transportation companies pay drivers by the load and not by the mile. So, these operators try to stay behind the wheel for as many hours as possible. Truck drivers and their families know all too well that these jobs involve very narrow profit margins, so operators must maximize revenue any way they can. Fatigue comes about in several ways. The root cause could be a lack of any sleep, a lack of quality sleep, or an irregular driving schedule. 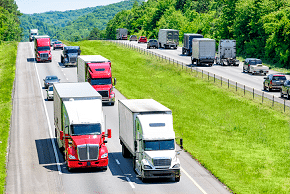 The federal government and most states, including Texas, have strict rules which limit the amount of time truck drivers can be behind the wheel. However, these rules are also rather complex. For example, the Federal Motor Carrier Safety Administration allows drivers to stay on the road for eleven consecutive hours, provided they had at least ten hours off prior to driving. In any event, the can never drive for more than fourteen consecutive hours. This rigorous rest schedule does not guarantee that truck drivers will get quality sleep. Largely because they spend long hours sitting, many truck drivers suffer from sleep apnea. These individuals never lapse into a deep and recuperative REM sleep. Instead, they basically doze all night. So, they are still tired even after sleeping a full night. Finally, the body’s circadian rhythm often comes into play. Most people are naturally drowsy early in the morning or late at night, even if they are otherwise well-rested. This problem is even more acute if the person recently changed work schedules. Alcohol also causes a large number of Houston truck crashes. Operators are dangerously impaired after just one drink. Alcohol inhibits motor skills and impairs judgment ability. Furthermore, impaired drivers have a hard time multitasking. They cannot watch the speedometer and the road at the same time. That point leads to the third major cause of truck accidents, which is speeding. At freeway speeds, large trucks are almost impossible to control in an emergency. Speed decreases the time that drivers have to react to a roadway hazard. Additionally, speed increases the force in a collision between two objects. As mentioned earlier, a fully-loaded large truck is dangerous enough. A fast-moving, fully-loaded large truck normally causes catastrophic injuries. Serious burns are a good example of catastrophic truck collision injuries. Diesel fuel burns at a different temperature from ordinary gasoline. So, whereas fires are rare in vehicle-on-vehicle collisions, they are rather common in truck-on-vehicle collisions. Truck crash burn victims normally sustain third or fourth-degree burns. These injuries essentially melt skin and even bone. As a result, the victim must undergo painful skin grafts at a high-priced specialty burn center. Afterwards, the victim often faces months of equally painful and expensive physical rehabilitation. These victims also experience significant pain and suffering. The road to recovery is a long and winding one. Depression is a common side-effect of physical injury, especially since medical bills are piling up and there is no way to pay them. So, substantial compensation is available in these cases. But the insurance company does not just give it away. The victim/plaintiff must have a solid legal theory to support the damage claim. Negligence and negligence per se are the two most common truck crash theories. Once again, operator fatigue illustrates how both of them work. Sleep apnea claims usually involve negligence, which is a lack of ordinary care. Truck drivers with this condition know they should not drive, but they do so anyway. To establish sleep apnea, an attorney must go through piles of medical records from different facilities. This laborious process usually involves reviewing records from several different states. If the tortfeasor (negligent driver) owed a legal duty and violated that duty, and the violation substantially caused the victim/plaintiff’s damages, the tortfeasor could be liable for damages. Hours of Service (HOS) cases work differently. As mentioned, the government has strict HOS rules. If truck drivers violate these rules, they may be liable for damages as a matter of law under the negligence per se rule. In these situations, victim/plaintiffs need only prove cause. In South Texas, large truck crashes are very common and very serious. For a free consultation with an experienced personal injury attorney in Houston, contact Simmons & Fletcher P.C. Home and hospital visits are available.